A Rio Grande Valley political fight for the ages enters its home stretch as early voting begins Monday in the Democratic runoff battle to succeed retiring U.S. Rep. Ruben Hinojosa in Texas’ 15th Congressional District. 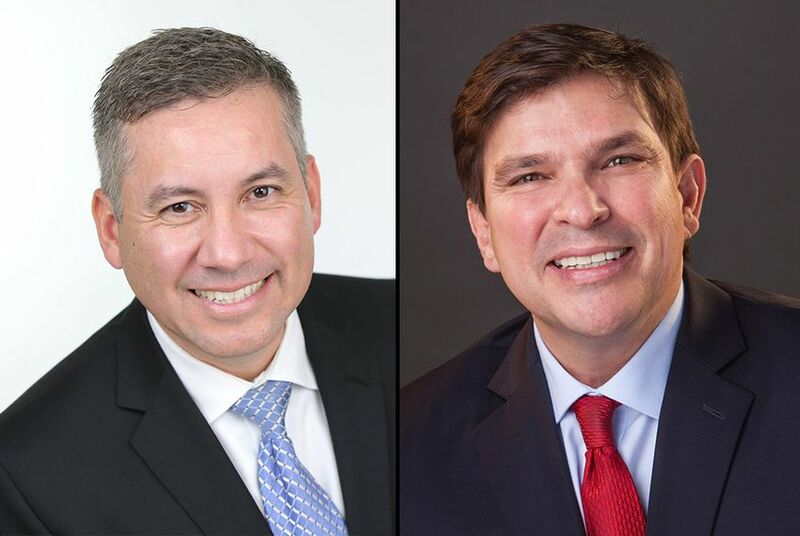 A Rio Grande Valley political fight for the ages enters its home stretch as early voting begins Monday in a bruising contest between two men with deep political ties battling to succeed retiring U.S. Rep. Ruben Hinojosa in Texas’ 15th Congressional District. Edinburg school board member Juan “Sonny” Palacios Jr., scion of a powerful family in the region, faces off against attorney Vicente Gonzalez, who’s generously funded his own campaign, for the Democratic nomination runoff on May 24. "It’s the age-old battle, which one is going to win: the money and the media blitz [of Gonzalez] or the slow and steady grassroots approach [of Palacios]?” asked Hidalgo County Democratic County Chairman Ricardo Godinez, who has not endorsed in the race. There is a Republican runoff for the seat as well, but the district's Democratic makeup makes it almost impossible for anyone but the Democratic nominee to win the November general election. And because Democratic incumbents rarely lose federal primaries, the winner of this nomination fight is a reasonable bet to hold the seat as long as he would like to serve. The 15th District is a geographically slender stretch beginning at the Mexican border in McAllen and snaking north to Seguin. Gonzalez, a 48-year-old trial lawyer and political neophyte, loaned his campaign so much money that he's personally outspent all but four U.S. House candidates nationwide, according to the Center for Responsive Politics. As of last week, he'd lent his campaign $1.65 million and spent about $1.7 million. The spending helped him emerge from a crowded field in the first round of the primary. Initially unknown, Gonzalez nearly cracked the majority of votes on March 1 and almost averted a runoff altogether, falling short at 42 percent. Palacios, 44, is also an attorney who is self-funding his campaign, to the tune of a much-smaller $261,000. He pulled 19 percent of the primary vote, and squeaked into the runoff. Heading into the final stretch, Gonzalez had the upper hand in spending by a large margin, and at first blush, the betting money is that Gonzalez will win on May 24, thanks to his name identification and infrastructure. Not so fast, say some race observers. The Palacios name is a priceless commodity in the Rio Grande Valley. For decades, the candidate himself and his extensive extended family have held a litany of public titles and nurtured deep relationships in Democratic circles. In the small world of South Texas politics, it seems everybody knows a Palacios. Democrats on the ground say Sonny Palacios is dogged in his pursuit of votes and ought not be discounted. There is a clear frustration within the Palacios camp that Gonzalez is attempting to buy the election. But Gonzalez, who has a bootstraps story of putting himself through law school, is unapologetic. “I don't apologize for spending my own money to share our positive message and vision with voters,” Gonzalez said in a statement. “Even though I financed most of my campaign, over 140 donors, mostly from the Rio Grande Valley, have stepped up to donate their own personal money because they share the same optimism I have about moving South Texas forward." As for Palacios, he said in a phone interview that he is “confident” about the race. There is another layer of uncertainty in the race: voter fatigue. This will be the third time in three months that parts of the 15th District host local elections. First came the March 1, primary, and earlier this month there were several municipal races. Local insiders expect dismal turnout, and both men face daunting expectations to get out their vote. “I can tell you on a county-wide basis, it is very difficult to get [voters] out," said Godinez. While Palacios has intensive local relationships, Gonzalez has friends in high places as well — in Washington. Just Friday, the 76-member Congressional Progressive Caucus endorsed Gonzalez. Several weeks ago, he could be spotted walking the halls of the U.S. Capitol with U.S. Rep. Ruben Gallego, an up-and-coming freshman Arizona Democrat. When interviewed, Gallego gushed about Gonzalez’s capacity to serve and said their friendship goes back several years. Besides Gallego, a succession of sitting Democratic members — at least 10 in all — from across the country either endorsed or donated from their own campaign accounts to the Gonzalez organization. U.S. Rep. Gene Green of Houston contributed to Gonzalez, along with several high-ranking House Democrats, including U.S. House Minority Whip Steny Hoyer of Maryland. Two other members of Democratic leadership gave to Gonzalez: U.S. Reps. Xavier Becerra of California and Joe Crowley of New York. The impetus, two Congressional staff sources tell the Tribune, was twofold. Back in December, a powerful Washington lobbyist with Rio Grande Valley roots named Moses Mercado visited the district while in the state on a family trip. He met with Gonzalez and said he saw potential for Gonzalez as a future Democratic political talent. Mercado is a former chief of staff to Green as well as to former House Minority Leader Richard Gephardt. He is also highly influential over members of Congress, specifically the Congressional Hispanic Caucus. Gonzalez had another validator in Washington: U.S. Rep. Filemon Vela, the neighboring Democratic congressman from Brownsville. Vela has not formally endorsed in the race, but said he considers Gonzalez a friend and former friendly rival in the local legal community. “I did have quite a few members come to me and ask me what I thought of Vince, and I told them exactly what I thought, which is Vince is a great person,” Vela said. But he is emphatic: There was no endorsement. So far, no Congressional members have contributed to the Palacios campaign, which could end up being a bit of a gamble if Palacios wins and members find they bet on the wrong horse. The bets in Washington are on Gonzalez. But down in the Valley, there's enough uncertainty that some anticipate a suspenseful election night. Palacios said that should he win, he won't come to Washington with any ill will.